Some time back I introduced y’all to Ruth of the Healthy Hair Method who sold products here in Botswana and had the stunning tresses to back it up. She has since returned to the US however with technology, people are only ever an email (or blog) away. She has an affinity for doing hair challenges and her most recent is the wig challenge. During the challenge she has discovered an amazing hair mask that she says is doing wonders for her hair, and of course it would be evil to keep it a secret! Time to delve into those kitchen cupboards and pamper your hair ladies! I wanted to share this mask I have been doing for my hair over the past few weeks with your readers. I am completely in love with the wonders it is doing for my hair. I embarked on a one year wig challenge… This consists of using wigs as a protective style for one year with the goal of retaining 90-100 percent of new growth. 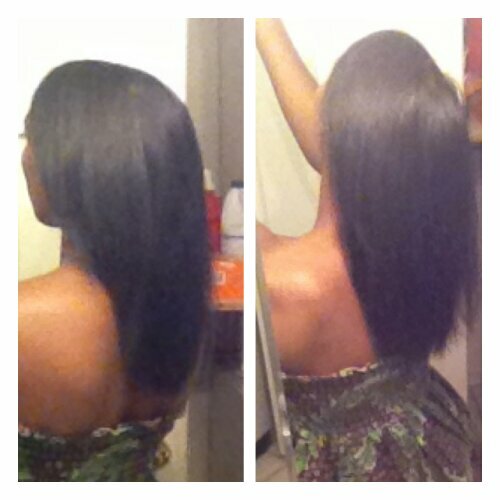 My goal is 6 inches added to my hair (Picture below is a before picture taken July 2013). Deep condition my hair at least 1x a week. I alternate between condition based masks and FOOD based masks! Shampoo 2x a month. I shampoo AFTER the food-based masks. 2 tablespoons of honey +/- eggs (I only add this 1x a month bc I want to avoid over proteinizing). Combine all products and blend! This mask is the solution I have been looking for! Banana: loosens my curls (i have 4b/c hair and this makes my hair 100% 4b) and reduces the shrinkage drastically. Mayo: nourishes and strengthens your hair as it has some properties of eggs and plant based oils. It also enables the treatment to spread better through hair strands. Coconut oil and olive oil: nourish, moisturize and strengthen hair. Coconut oil is made of small particles so it can penetrate hair follicles. Honey: a humectant that pulls in moisture from the environment. I usually co-wash my hair every other day alternating a cleansing conditioner with a lightweight moisturizing conditioner. This method enables me to be able to start my treatment without washing my hair. In fact, it is my “pre-poo” treatment. I tend to go overboard so this sits on my hair overnight under a foil cap (you can substitute this with a plastic bag). Oops I forgot to mention that I tend to heat the oils before I blend the products together to enable better penetration. And there it is! I will definitely give a try soon and see how my hair responds. The kitchen is a great place for sourcing hair mask ingredients, you don’t always need to break the bank to treat your hair! Next Post My current hair products….